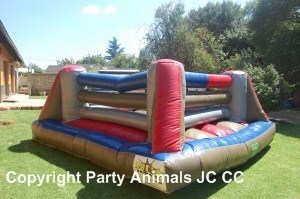 The Adult Wrestling Ring is great entertainment at any teenager’s party or any adult function. This is also a great castle for team building events and corporate events. Castle rental includes the oversized boxing gloves. The Motor is a 1.1kw motor with a 15m extension lead. If the power point is further than 15m from where the slide will be placed, you will need to supply an additional extension lead. These are not provided by Party Animals.